The crayfish in this jar were collected from an acidic lake in Ontario during the summer of 1979. They represented one small part of the broad-ranging set of research interests of Dr. Harold Harvey, Professor Emeritus of Ecology and Evolutionary Biology at the University of Toronto. Harvey brought to the public’s attention the problem of acid rain, and his research and advocacy were instrumental in the development of measures to curb air pollution that was a significant cause of the acidification of lakes and rivers in Canada and the United States. This particular sample of crayfish was likely collected as part of a project examining the accumulation of metals in the tissues of crayfish in acidic and non-acidic lakes in Ontario. In the late 1960’s, professor of zoology at the University of Toronto Harold Harvey and his graduate student Richard Beamish were studying a population of white suckers (a type of bottom-feeding fish) in a lake near Sudbury, Ontario. They caught and tagged a number of individual fish, to follow their numbers over time. Yet when they came back to collect them, they found that the number of fish in the lake had suddenly decreased. They investigated with locals, many of whom had enjoyed fishing in the area for decades, and found that this loss of fish was happening to other lakes as well. By 1971, there were no fish caught in the lake at all. Puzzled and disturbed by these findings, Harvey and Beamish shifted from their original research to investigate the potential causes of this sudden loss of fish. They found that concurrent with the loss of fish in these areas was a decrease in the pH of these lakes (that is, that they were becoming more acidic), which could not be explained by natural geological or other inputs. They proposed that the loss of fish in these lakes was ultimately caused by acid precipitation and runoff as a result of the release of sulphur dioxide into the air by nickel smelters in Sudbury, about 100 kilometres away. Harvey and Beamish attempted to bring this information to the public attention, but their story was rejected by three national magazines before it was finally covered in 1971 by the Globe and Mail. Through tireless activism, research, and political engagement, Harvey’s subsequent career was centered around bringing to the attention of the Canadian public the reality and consequences of acid rain, and in expanding research programmes designed to study the effects of acid rain and the effectiveness of measures designed to prevent it. Significantly, Harvey’s research and advocacy was crucial in the signing of a Canada-US agreement in 1991 between Canadian Prime Minister Brian Mulroney and American President George Bush to reduce the air pollution that causes acid rain, including sulphur emissions. Harvey’s research ranged widely. While many of his studies focused on the population dynamics and ecology of the white sucker, he also studied the effects of acidic conditions on the feeding behaviour of crayfish and on metal concentrations in their tissues. 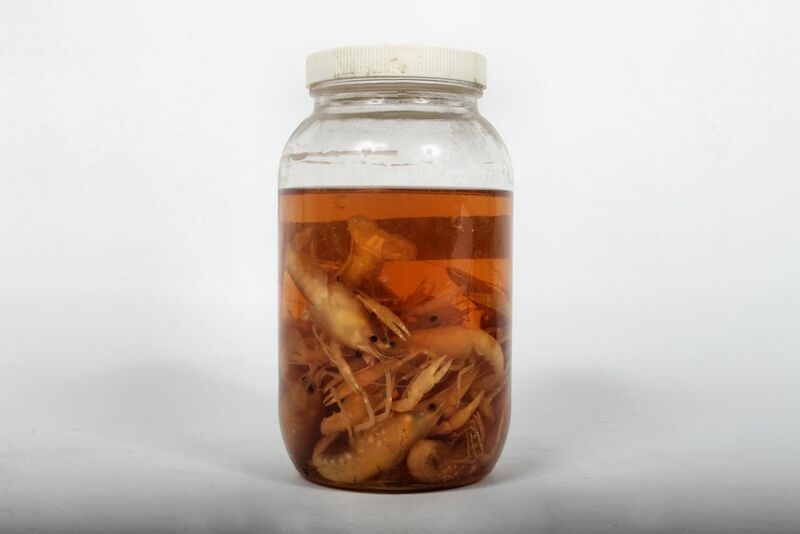 These particular crayfish were collected from Crosson Lake in 1979, likely as part of a study on the accumulation of metals in the tissues of crayfish from a set of acidic and non-acidic lakes in Ontario. This research revealed that concentrations of cadmium in the gills of crayfish in acidic lakes was significantly greater than crayfish from control lakes. As crayfish are important food sources for a wide range of species, and are relatively acid-tolerant, these results suggested that they could potentially be an important source of cadmium and other metals to higher trophic levels. 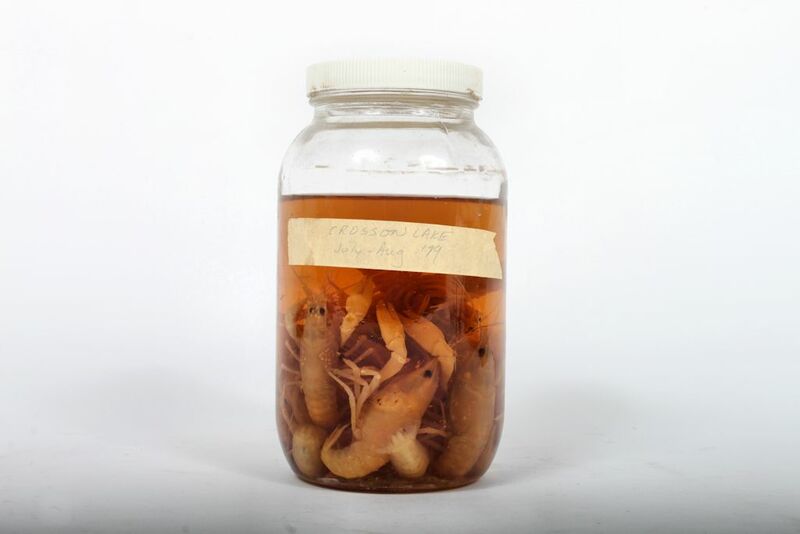 The dates and location indicated on the jar suggest that these specimens were collected as part of a study on the accumulation of metals in crayfish tissue in acidic and non-acidic lakes in Ontario. In this study, the results of which were published in an article in 1991, crayfish were collected from four acidic lakes (including Crosson) and two neutral lakes in Ontario. They were captured either by minnow traps, or by hand by scuba divers during the month of July. Crayfish were measured, weighed, sexed, and classified to species, before their carapaces, gills, and abdominal muscles were removed for metal analysis. Because the specimens in the jar are intact, they were not likely analyzed for metal concentrations in this way. The exact purposes for which these specific crayfish were collected is unclear. This item was donated to USTIC from the laboratory of Dr. Harold Harvey, Room 419 in the Ramsay Wright Zoological Laboratories building at U of T, in November 2016. 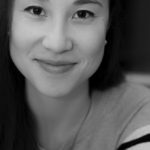 Riiko Bedford has a PhD from the Institute for the History and Philosophy of Science and Technology at the University of Toronto. She has been involved with UTSIC since 2012. Beamish, R. and H.H. Harvey, “Acidification of the La Cloche Mountain Lakes, Ontario, and Resulting Fish Mortalities,” Journal of the Fisheries Research Board of Canada, 29.8 (1972): 1131-1143. Gorrie, P. “Acid Rain Fighter: The Story of One Man’s Persistent Efforts to Get Us to Stop Polluting the Environment,” Canadian Geographic, (October/November 1986), pp. 8-17. Young, L.B. and H.H. Harvey, “Metal Concentrations in Crayfish Tissues in Relation to Lake pH and Metal Concentrations in Water and Sediments,” Canadian Journal of Zoology, 69 (1991): 1076-1082.